Noteslate is a company with a reputation for not keeping its promises, so the following should be taken with a grain of salt. 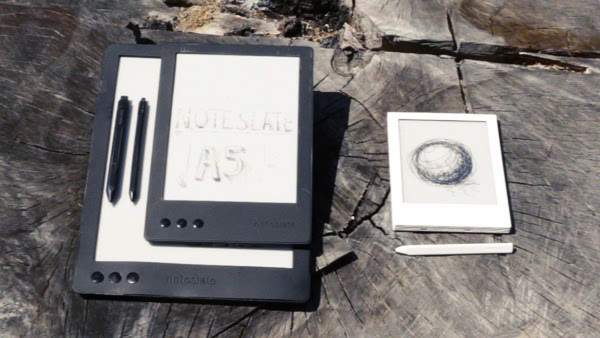 The Noteslate Shiro is a digital writing slate with a 6.8" E-ink screen and a stylus. It was announced in April with a promised delivery date of some time this fall, but the launch date was pushed back until next spring. 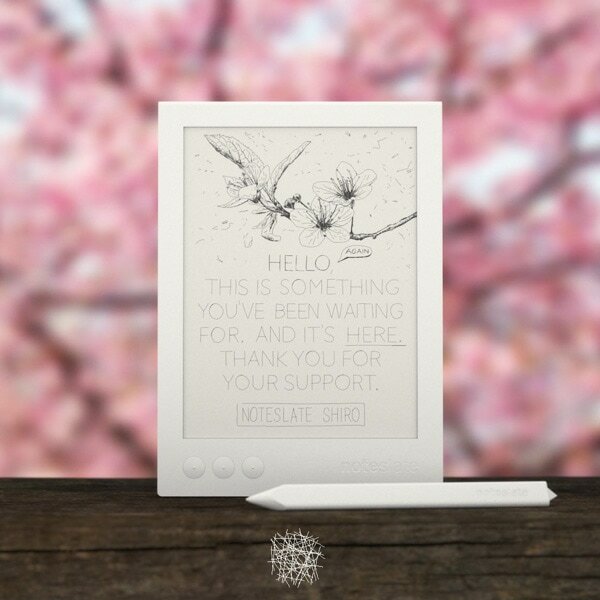 Yesterday Noteslate sent out its first newsletter to its followers, apologizing for the delay and promising that the Shiro would ship next spring to all who pre-ordered it (the cost is $199). While I had reported all this last week, the newsletter also contained a couple new details that confirmed some rumors that had been going around. Noteslate hasn't revealed many details about the Hero, but they have said that they expect to have it ready some time in 2016. The price, specs, and actual ship date are still to be determined. The company is also planning apps for Android and iOS. ... promotional video makes the product look terrible. Looks like chicken scratch with a terrible dose of latency. I kept expecting to see this scribbling turned into nice formatted text. But no. Just the ability to write your own chicken scratch on an E-ink screen. If you get some time with the Noteslate, do let us know. We're all curious about what it can really do. Will this be better or cheaper than the Sony Digital Paper DPT-S1, do you think? I wonder, what screen they plan to use for the the 9.7″ model. Maybe it will just be a WISEreader E920 in a different case and with Noteslate’s own software. At least the technology for all of these models does seem to exist, since 6.8″, 9.7″ and 13.3″ EPD devices with pen input could be obtained from Netronix, Hanvon and Sony, respectively. I don’t know what OEM these will be based on but I bet Netronix could theoretically supply all three models. The designs are basically the same, with only the screen sizes and software to distinguish between the devices. But I’m not convinced that Noteslate has the technical chops to pull it off, even with the help of Netronix. Yes, alas, unfortunate as it is, I also have my doubts. Persistence may yield results though, so let’s hope for the best. At least there’s always time to stretch the schedule. I have mixed feelings about this. I am passionate about digital handwriting tools, and have bought all the e-ink writing slates I could get my hands on since 2011. I continue to believe that there is a market for replacing millions of paper notebooks around the world. – Lack of functional information about the device, e.g. ebook formats supported, RAM, processor, storage, size, weight, etc. – Based on their first appearance in 2011, we can’t be sure that this is not a fraud or somebody’s marketing project for school. Despite what the Noteslate guys would have us believe, there are alternatives out there. On the low end there is the Boogie Board 9.7 Sync (around 100 USD), which does a little less than what the Noteslate will likely be able to do. On the high end there is the Onyx Boox M96 (around 350 USD) with full Android on board, which definitely has more functionality than the Noteslate ever will. 1. Delivery and functionality: when the device actually comes to market, and will delight or disappoint the early adopters? 2. Price: will the larger versions be competitive? 3. Marketing: with the saturation of the e-reader / tablet market, Noteslate will need to make a lot of noise and differentiate itself from the competition in order to sell in meaningful quantities. I wish them luck and look forward to the devices!